In September 2018, presidents Vladimir Putin and Recep Tayyip Erdogan reached an agreement in Sochi that averted a disastrous battle for Syria’s Idlib province. Yet the ceasefire at the heart of the Sochi deal is now in danger, as violence between the Syrian government and Idlib’s militants steadily escalates. In a new report, we at International Crisis Group survey Idlib’s armed factions and the state of the Sochi deal. We argue that Russia and Turkey should re-commit to Sochi and stabilize Idlib, staving off a military confrontation that would be a humanitarian catastrophe. It could also scatter Idlib’s militants outside Syria’s borders, turning them into a global threat. Idlib is Syria’s last real bastion of opposition control. The province is home to Syria’s most committed rebels, including thousands of jihadists. Yet there are also nearly three million people in the Idlib area, mostly civilians, nearly half of them displaced from elsewhere in Syria. There is no obvious way to neutralize Idlib’s jihadist threat without inflicting a terrible toll on the area’s civilians. Russia and Turkey’s deal in Sochi avoided a seemingly imminent Syrian military offensive on Idlib. The Syrian government needs Russia’s support, and Russian airpower in particular, for an Idlib offensive to be viable. But while Russia aims to deliver its Syrian ally to a military and political victory, it must also balance that goal against other priorities– among them its developing bilateral relationship with Turkey and its efforts to involve Europeans in rebuilding Syria. For its part, Turkey is keen to avert a humanitarian disaster that would send a huge new wave of refugees (and some of Idlib’s militants) towards its border. 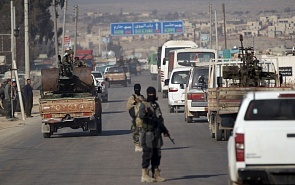 The Sochi deal’s terms included a number of measures to curtail the threat of Idlib’s militant groups, including the creation of a demilitarized buffer around the area cleared of heavy weapons and “radical terrorist groups.” Sochi also required coordinated Turkish-Russian patrols of the demilitarized zone and, by the end of 2018, the opening of the major highways crossing the rebel-held area. Turkey launched its first such patrols this month, but it still has much farther to go in implementing Sochi’s terms. Until recently, Russia has been actively preparing for a large-scale military operation in the province of Idlib, as well as in Latakia, Hama and Aleppo, conducting an appropriate foreign policy together with military preparations. Inside Idlib, Hei’at Tahrir al-Sham – “HTS,” the latest iteration of former Syrian al-Qaeda affiliate Jabhat al-Nusrah – has only grown stronger. In January, it eliminated a nettlesome rival faction and asserted its clear dominance over the area. Alongside HTS, Idlib’s other militants range from local rebels defending their home communities to committed, internationally oriented jihadists. Of Idlib’s jihadists, a mostly Uighur Chinese faction called the “Turkistan Islamic Party in Syria” is among the most obviously threatening internationally. The group is the Syrian wing of a group active in Afghanistan with historic links to al-Qaeda, and it is avowedly committed to war against the Chinese state. Idlib is also home to smaller groups of jihadists from the Caucasus and Central Asia. These groups are aligned with HTS. Yet HTS’s own aims have become less clear over time. With victory over the Syrian government increasingly out of reach, the group has occupied itself with an Islamist governing project inside Idlib. It has repeatedly made pragmatic compromises that contravene jihadist orthodoxy but seem meant to safeguard Idlib, and HTS with it. The group appears interested in dealing for its own survival; Turkey believes it can further push HTS in a constructive direction, and that it may even be possible to enlist the group in quashing transnational threats inside Idlib. A direct military confrontation with Idlib’s armed groups would be ugly and costly. While preparing for an offensive last September, Russia tried to surreptitiously broker deals with Idlib notables and rebels to facilitate the regime’s advance and isolate HTS – it failed. Syria’s most intransigent militants and civilian oppositionists have concentrated inside Idlib. They reject the return of Damascus’s rule; even Damascus itself seems not to want many of Idlib’s residents inside its future Syria. A battle for Idlib will be brutal. It will risk the stability of Russia’s Turkish partner and shock the same Europeans Russia is courting for Syria’s reconstruction. A military solution in Idlib is also no real answer for Russia’s counterterrorism concerns. Idlib’s militants are a major security worry, but they will pose a much larger threat if an attack scatters them beyond Syria’s borders. Right now, the most problematic individuals inside Idlib seem to be concerning mostly because their biographies and skills make them a potential threat, not because they are currently plotting international attacks from inside the area. A Syrian military offensive on Idlib risks driving them into Turkey and, from there, Europe and the post-Soviet space. They could connect with jihadist groups around the world and become an accelerant to a networked global threat. Keeping the Idlib area intact is the better option for Russia and Turkey alike. To be sure, a “better” answer does not mean a “good” one. For Russia’s Syrian ally, Idlib’s militants are a threat to surrounding loyalist areas. An insurgent-held Idlib disrupts the Syrian government’s security regime along its Turkish border and truncates Syria’s sovereignty. And for Idlib’s civilian residents, their future under continued militant control is bleak. Still, all of this is better than a military offensive that would spell large-scale displacement and death. Russia and Turkey should re-commit to the Sochi deal and press the Syrian government and Idlib’s militants, respectively, to halt their attacks. Each side now frames its assaults as retaliatory. To salvage the Sochi agreement, Russia and Turkey must break this cycle of violence. For its part, Turkey needs to do more to implement Sochi’s terms and show Russia it is a committed, good-faith partner. Turkey’s recent patrols of the demilitarized zone are a positive step; they should be expanded. Turkey should also press HTS to loosen its grip on Idlib’s highways, and Turkey and Russia should coordinate to open the roads to free movement and trade. Maintaining the Sochi deal is by no means an ideal solution, but for now it is the best one on offer. A stabilized Idlib will allow Russia to keep investing in its developing strategic relationship with Turkey, and it will spare Syria from yet more destruction.